It’s a good thing The Hub shopping center on Route 59 in Central Nyack has a covered walkway, because the morning line for Nyack Hot Bagels & Deli has been known to stretch right out the door. Given how spacious the uncluttered interior is (it used to be two separate storefronts), that’s quite a feat. But don’t worry — the line moves fast, and so do the bagels, ensuring a constant rotation of hot, fresh goodness. 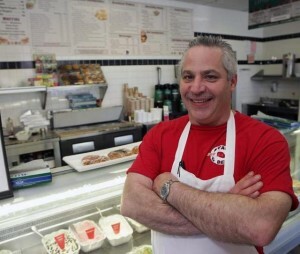 Frank Salemme has owned Nyack Hot Bagels & Deli since 1995. “I was working in a restaurant, and then when I got married I didn’t want to work nights anymore,” Salemme explains, “but it’s an exchange — instead of working late at night I’m working early in the morning!” Salemme and his team are hand-rolling bagels by 4 a.m. every day for the store’s 5 a.m. opening. Nyack Hot Bagels & Deli specializes in hand-rolled and boiled bagels. A video on its website shows the rolling process, along with a scientific explanation of the difference that hand-rolling and boiling make (short version: It makes them fluffy on the inside and chewy on the outside). To accompany Salemme’s 13 varieties of bagels, there’s an equal number of freshly made cream cheeses — standards like Scallion and Vegetable as well as new and modern varieties like Horseradish, Jalapeno and Bacon-Red Onion. For the non-bagel-minded, other breakfast options include muffins, breakfast sandwiches and egg and omelet platters. Of course the bagels are only half the story: Nyack Hot Bagels & Deli also features a full deli.